In 2020, for the first time in more than 20 years, a reaction that only occurs in the core of the stars will be produced on Earth in a man-made machine. In the European JET, the largest tokamak presently in operation, deuterium and tritium will fuse again as they did with spectacular results in the late 1990s and, more discreetly, in the 2003 campaign. Equipped with a beryllium wall and a tungsten-clad divertor, JET is the only tokamak to present the same material environment as ITER. In 1991, JET was the first machine to produce a significant amount of power from deuterium-tritium (DT) fusion. Six years later, the DT campaign culminated with a 16 MW shot and—less spectacular but more significant for the future of fusion—with a series of 5-second, 4 MW stationary shots in H mode, which formed the basis for an extrapolation to ITER. With the exception of trace tritium experiments in 2003, the JET campaign in the 1990s was the last time that actual fusion fuels were implemented in the European machine. As the ITER Organization is now preparing to assemble the ITER machine in time for a first, non-nuclear plasma in 2025, JET is being groomed for yet another DT campaign—although this time in a different context and with different objectives. "In 1997, JET aimed at producing maximum power and did it in conditions that were not fully representative of ITER operation," explains Xavier Litaudon, the head of the EUROfusion ITER physics department. "Today, things are different. We are aiming for stability rather than peak performance. And we will be operating in conditions that will be those of ITER." The JET of today is a very different machine from the JET of the previous decades. Now equipped with a beryllium wall and a tungsten-clad divertor, it is the only tokamak to present the same material environment as ITER. 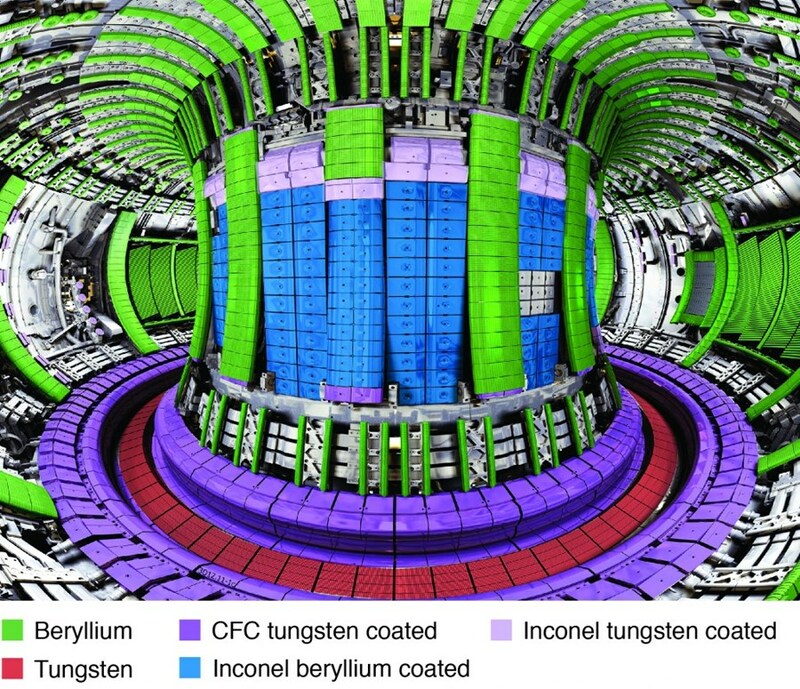 Despite technical limitations (essentially due to its non-superconducting magnetic system and non-actively cooled divertor), JET can now be described as an "ITER-like machine," and the feedback from the upcoming DT campaign will be of immense value to the much larger, much more powerful international tokamak. "JET is bringing one essential contribution to future ITER operations," adds Litaudon. "WEST, with its capacity to produce non-nuclear plasmas up to a 1,000-second duration, is bringing another." For Litaudon and the JET team "what matters now is not to break records," nor even to improve the input-to-output ratio¹, but to develop a plasma regime that can be extrapolated and implemented in ITER. 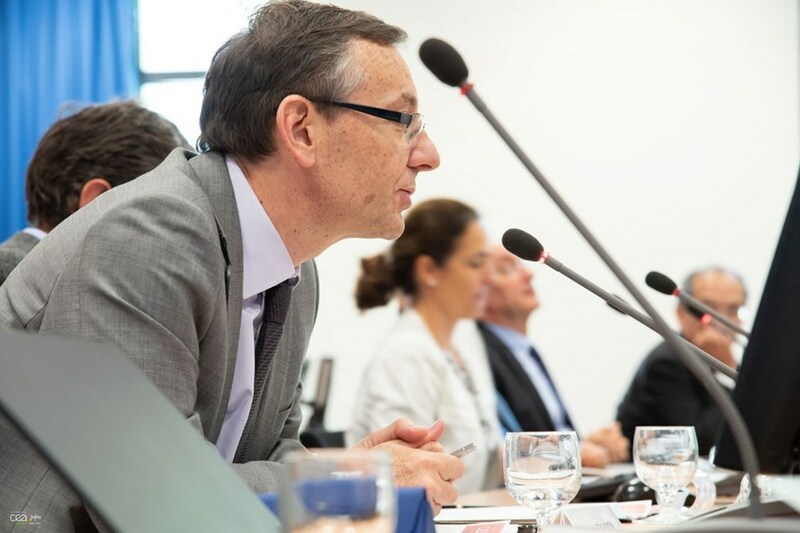 "The objective that has been assigned to the 2020 DT campaign is to produce plasmas generating approximately 15 MW of fusion power during 5 seconds," explains Litaudon. Two approaches have been developed to help reduce the effects of disruptions, both based on the delivery of material inside the plasma within milliseconds. One consists in injecting massive quantities of gas into the plasma, the other in shooting frozen gas pellets. Experiments conducted on the DIII-D National Fusion Facility at General Atomics (US) have demonstrated that the latter was better adapted to the ITER environment and operating mode. In order to establish that shattered pellet injection (SPI) is a technology that can be extrapolated to ITER, a significant part of JET's upcoming campaign will be devoted to testing the pellet injector developed by the US Department of Energy's Oak Ridge National Laboratory (ORNL). A collaboration agreement involving the ITER Organization, the US ITER Project Office, the ORNL Fusion and Materials for Nuclear Science Division, EURATOM (including the EUROfusion Consortium that is responsible for the JET scientific program), and the Culham Centre for Fusion Energy (operator of the JET facility) has been set-up in order to build, install and operate an SPI system for disruption mitigation on JET. Testing of the shattered pellet injection system on JET is set to begin in May 2019. In 2015-2016, in preparation for the upcoming DT operations, JET went through an eight-week technical rehearsal with hydrogen and deuterium plasmas. "By extrapolating the amount of neutrons produced during these experiments, we can estimate that, had we implemented the actual fusion fuels, we would have obtained 8 MW of power for a few seconds. This is about half the power and half the duration we expect from the 2020 campaign." Litaudon acknowledges that "it will be difficult" and that the machine will be "pushed to the limits." Some 40 MW of heating power will be injected into the DT plasmas, 5 to 6 MW from the ion cyclotron resonance heating (ICRH) system, with the remainder from the "old" but significantly upgraded neutral beam injection system that already had been used in the 1997 campaign and is considerably less powerful than the ITER neutral beam system. Before entering the DT phase, JET will experiment with "pure tritium" plasmas—a first in the history of fusion research. "Because of the nuclear structure of tritium (one proton, two neutrons), a pure tritium plasma is heavier than a plasma with deuterium (one proton, one neutron). By implementing a pure tritium plasma and interpolating the results from both deuterium and tritium plasmas we'll get a much more precise idea of the behaviour of an actual DT plasma." By the end of the 2020 campaign, JET, already a venerable installation, will have reached the canonical age (for a tokamak at least) of 36 years. "Logically, the end of the campaign should be the end of JET, but we are working on an extension into at least 2024. We can make the machine even more ITER-like. And if our colleagues at ITER have a question or a theory, we want be able to respond: 'No problem, let's test it on JET...'"
Keeping JET in activity beyond 2020 also means that a machine will be available to train ITER operators—a key issue for EUROfusion. "In ten years, even the best engineers and physicists can lose their knowledge and competence if they don't put them to test." ¹- In 1997, the ratio between heating power input and fusion power output, or "Q," was on the order of 0.70. Improving "Q" is not among the objectives of the 2020 DT campaign at JET. ITER aims for "Q ≥ 10": 50 MW of heating power → 500 MW of fusion power.